The driver of a tractor-trailer fell asleep at the wheel this morning in Berks County and ended up plowing his 18-wheeler through 9 vehicles, killing two people and injuring nine others. 50-year-old Steven Bernier, of Reading, PA, dozed off on Route 222 (Allentown Pike) near Route 73 in Maidencreek Township around 6:30 a.m. Wednesday. He slammed into a line of cars stopped at a traffic light. Some cars simply flipped over. 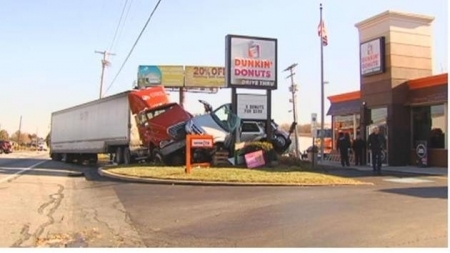 The truck came to rest pinning two vehicles against a Dunkin' Donuts sign. A total of nine other vehicles were involved in the crash. The other injured were hospitalized with none life threatening injuries. Bernier is charged with two counts of homicide by vehicle, nine counts of aggravated assault while driving, two counts of involuntary manslaughter, and various traffic offenses. Authorities have identified Jane Harakal, 32, of Topton, and Jeremy Augustine, 23, of Ammaus as the two individuals who were killed. Former Philadelphia District Attorney Lynne Abraham has officially announced that she will run for mayor. She was elected as District Attorney five times starting in 1991 until she decided not to seek reelection in 2009. Abraham was elected citywide as a judge three times prior to that. Philadelphia has never had a female mayor in it's 334 history, but it also never had a female DA until Abraham. Her candidacy will benefit from her name recognition in the city. She shook off questions surrounding her age (73) but seems to welcome any competition and disruption to the status quo in the Democratic Party that her presence in the race might bring. The company that won a bankruptcy auction in October and was approved to buy the shuttered $2.4 billion Revel Casino Hotel in Atlantic City has canceled the deal. Brookfield US Holdings, LLC. planned to purchase the property for $110 million and reopen it as a casino. Brookfield, based in Toronto, also operates the Hard Rock Casino & Hotel in Las Vegas and Atlantis Paradise Island in the Bahamas. The company could not come to agreement with bondholders controlling debt related to Revel's power plant. Florida-based developer, Glenn Straub, bid $95.4 million. That was the backup offer. He has plans to turn the property into an exclusive 'genius' university and is still very interested. Partly Cloudy, temperatures in the low 30's this evening in Center City.